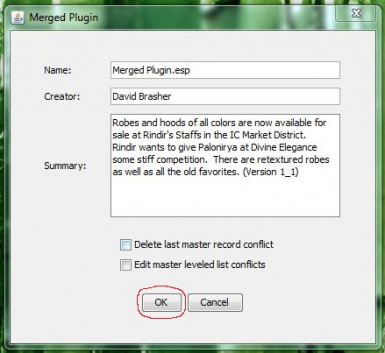 This pictorial tutorial shows you how to merge Oblivion mods using TES4Gecko. Word processor document, 12 pages with 11 images. Public domain with proper attribution and courtesy notification. Abiding by that, feel free to modify this, share this, or use it in whole or in part in another tutorial. Bethesda for making Oblivion in a format that anyone can mod. 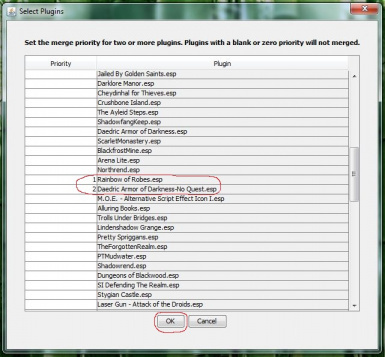 This pictorial tutorial shows you how to merge Oblivion mods using TES4Gecko. (1) Their load orders are too full and they can't install any more mods. (2) They still have space for more mods, but want to keep things simple or have a certain organizational system. (3) They are building or editing a mod and need content from two or more mods in one place so they can reconcile it and include it in the final mod in the desired form. WHAT MODS CAN YOU MERGE? It is best to only merge compatible mods. Mods that do not conflict with each other. Things get more complicated when you merge mods that conflict, because you have to be sure that the mods you want to win the conflicts do win them. 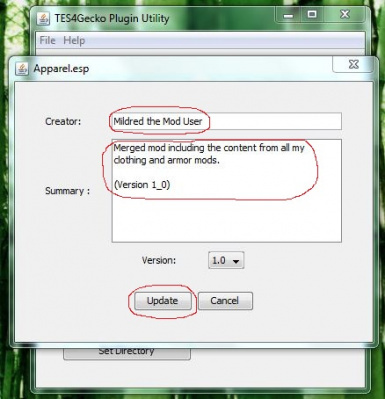 You may have to go into the CS and do a bunch of manual editing after you merge the conflicting mods in TES4Gecko. This tutorial only deals with simple mod merges that can be done completely in TES4Gecko and is aimed more at a gamer audience than a modder audience. (1) Content you created yourself. (2) Content from files that are modders resources. (3) Content made by other authors if you asked for and received permission to use their work. In most cases, you are required to list their name, the name of their mod, and its download location in your credits. If your mod is for personal use and never leaves your computer, you can merge anything you want. This is what you will be doing if you have more than 255 mods and are trying to get them to run all at once on your computer. It is best to only merge clean mods. You should clean them in TES4Edit, and in some cases TES CS too before merging them. This has the advantage of merging mods that generally don't conflict and makes organization easy. 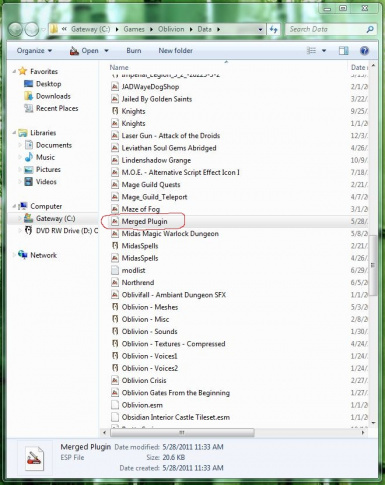 You have to be very careful if you want to merge things like dungeon mods and quest mods. You should avoid doing this unless you are good at using TES CS and really know what you are doing. If you merge mods with dialog, all the dialog will be lost when the name of the file changes. If it is voiced dialog it is a huge task to reconnect it all. 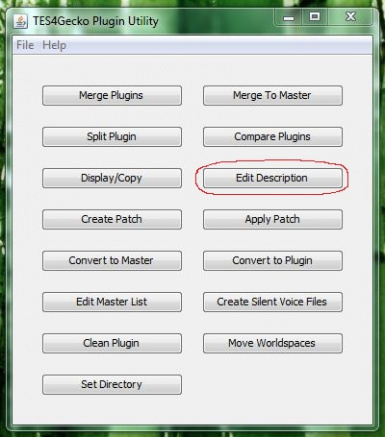 If it is silent dialog, you can use the TES4Gecko function to "Create Silent Voice Files." Unless you really know what you are doing, you should stick to just merging mods that are easy and automatic to merge like the armor mods. For our purposes, you will only want to merge .esp files. You will not want to be merging .esm Files (masters) and you certainly won't want to be merging .esp files to .esm files. 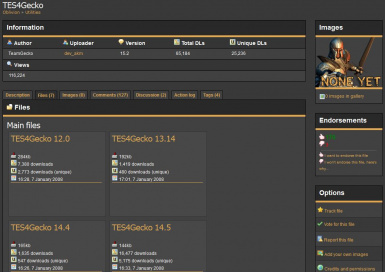 You will need to download and install TES4Gecko if you have not done so already. After you have downloaded and installed the program, you can begin. It is important to realize that merges do go bad sometimes. You will always want to keep backups of the files you are merging. I like to keep copies of all the compressed mods I have downloaded in their original compressed packages. The files are small when they are compressed and don't take much hard drive space. All the components are in one place, and I know that I have not been accidentally editing the files and that they are in the original form that I downloaded. When you merge files in TES4Gecko it does not destroy the original files, it creates a new file named "Merged Plugin.esp." The problem comes if you delete the files you used to create the merged file, and then discover bad bugs in it later on, and realize you need to make another merged file. So be sure that you do not delete your last copies of the original mods. Otherwise you may find yourself searching the Internet and trying to find the lost files so you can download and install again. (1) You start a new mage character and realize your merged mod is geared toward thief characters and is not fun to play. If you deactivate your merged mod, you will throw out the baby with the bathwater and lose all your mage goodies along with all the thief goodies you don't want right now. (2) You discover that one of the 30 mods included in your merged mod conflicts with a very large and popular mod that everyone is using and you want to use too. It would have been simple to deal with that one conflicting mod by disabling it, but now you can't disable it without disabling all 30 of your beloved mods. (3) The author of one of the 30 mods in your merged mod releases a new and improved version with bugfixes and new features you really want. Normally you would just download it and install it. But it conflicts with the old version in your merged mod, so you either can't use the exciting new file, can't use your merged mod, or have to take those 29 mods and the new file and build a new merged mod. In my example, there were 30 mods in the merged mod you were having so much frustration with. Imagine how many more problems you would have and how much more frustration there would be if your merged mod contained 250 mods! (1) How many mods do you want to merge into each one of your merged mods? (2) What categories will you use when merging your mods? (3) What parts of the game will different merged mods edit? (5) How likely are there to be mod conflicts with mods outside of your merged mod? The bigger your merged mod, the more likely that there will be conflicts and the harder it will be to fix. If you have 255+ mods and want to use them all, you may find yourself constantly creating new merged mods and scrapping the old ones because you run into these problems discussed above. You might think about keeping copies of your 30 mods in a special directory so they are all there and ready to go next time you want to make a change and create a new version of your merged mod. The category will be apparel. 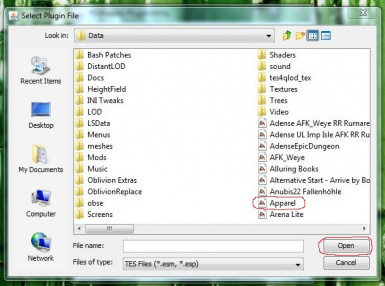 When we get to the proper stage, I will name my mod "Apparel.esp." (1) Make sure the plugins have been cleaned and are in the state you want them to be when merged. In some cases, this might involve advanced CS work to remove features or add features so that the mod is the way you like it and the merged result will be the way you like it. (2) Open TES4Gecko and click on "Merge Plugins"
(3) Find the names of the plugins you want to merge. Type numbers into the boxes in the "Priority" column for all the mods you are merging. If your mods do not conflict, it does not matter what numbers you enter. If your mods do conflict, assign lower numbers to mods to have them override mods with higher numbers. Do not enter any numbers for mods you are not merging right now. To preserve the file details from a particular file, set it as priority 1. Only do this if that file will not override anything you don’t want to lose. (5) Don't change anything when you see a window like this at this stage. There is a bug in TES4Gecko and you will crash the program if you change anything now. You will have an opportunity to go fix all this information later. I repeat: Do not change the name of the file. Leave it as Merged Plugin.esp. Do not change the Creator. Do not change the Summary. (7) If all goes well, the mods will merge, windows will open and close, possibly even so fast you can't read them if the mods are small, and things will come to rest at the window in the next illustration. If you do get some sort of error message and the mods cannot be merged, read the message carefully. It can tell you where the problem is that needs to be fixed. You could leave that mod out of your next merge attempt, or you could go into the CS and fix the bad mod so that it no longer has the bug and can be merged. (9) Open Windows Explorer and go to your Oblivion directory. Locate "Merged Plugin.esp. "Change its name. 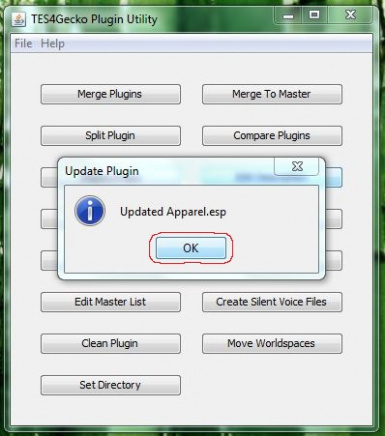 In my example, I am renaming to "Apparel.esp"You need to change the name because every time you make a merged mod, the new one will be named "Merged Plugin.esp" and you will get error messages or overwrite your valuable data if the name is already in use. (10) Open TES4Gecko again if it is not open. (11) Click on "Edit Description." (12) Click on the name of your file. (14) Edit the Creator name. (17) Click "OK." You are now done. Deactivate the mods you used to make your merged mod. Activate your merged mod. Play-test your new merged mod and have fun!